By Chris Murphy THE Corner Cafe – an institution beloved of curry lovers across Leeds – has re-opened to a wave of nostalgic emotion. It is 10 years since owner Karim Ghauri concocted his last round of bhunas, shimlas and massalas. But he's back to a loud chorus of approval from fans of Indian food and of the original laid-back atmosphere that has always complimented the cuisine. 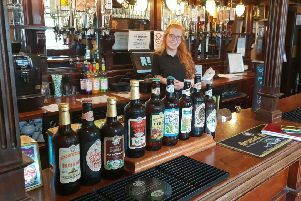 Karim, 38, along with his wife Kate Ghauri-Moore, has also maintained his old approach to alcohol, where customers can wander in with a pint of ale or glass of wine from the Queens Arms pub from across the road or even bring their own. "It's been fantastic so far," Karim told the YEP. "We've no pretensions here and aren't trying to be something we're not – we just love cooking, as well as the people and the atmosphere of the place. "People who used to come in 10 years ago have been back already because they had heard we'd re-opened, and customers have been bumping into people they haven't seen since we were last open. "There used to be such a great mix of people. "We'd have a couple on one table who were still in their overalls having been decorating all day and at the other end a bunch of musicians in dickie bows and dinner jackets – and all of them would feel equally at home." The first Corner Cafe, on Buslingthorpe Lane in Leeds, was opened in 1976 by Karim's father Muzamil and became a legend in its own lunchtime. Originally a transport cafe it changed when Muzamil started injecting his own authentic Asian cuisine into dishes churning out countless curried shepherd's pies and kebab sandwiches, alongside more traditional truckers fayre such as bacon butties. In the mid 1980s the family opened The Corner Cafe on Burley Road which drew a cosmopolitan mix of students, young professionals, families and the odd celebrity guest, such as former YEP reporter turned rock star Mark Knopfler. After leasing the building 10 years ago the couple decided to give it another go when it came up for renewal earlier this year. The menu shows a wide variety of sub-continent treats including an extensive vegetarian choice, and many of the old recipes created by Karim's dad. "We're not here to conquer the world or set up 10 more Corner Cafes, we're just happy doing what we are doing now," added Karim. The Corner Cafe is open in the evenings between Tuesday to Saturday. Call the cafe on 0113 234 6677 for more information.